The ethereal charm and beauty of the little town of Nottingham Road is really quite special. Massive, unspoilt dams that lie under the watchful eye of mammoth mountains ranges, quaint country inns surrounded by verdant woodlands, and rolling jade-coloured hills that are begging to be explored by keen adventurers make this part of KwaZulu-Natal nothing short of magical. Notties, as it is affectionately known, is almost 60 kilometres north-west of Pietermaritzburg and 136.5 kilometres from the urban centre of Durban (home to the King Shaka International Airport). It was originally established in 1905, when the Nottingham Regiment was stationed there in preparation for potential uprisings from the hunter-gathering San folk against the local farmers. Since then, however, it has become popular for the world-class trout fishing that it offers to keen anglers and hobbyists alike. The town is only a short drive from the foothills of the magnificent Drakensberg Mountain Range, which offers prime hiking, walking, camping and bird watching opportunities to those who love the outdoors. This is also a stunning spot for photographers that want to capture the splendour of South Africa, as she shows off a little of her natural loveliness. Notties is part of the Midlands Meander and offers visitors a variety of things to see and do. The region is home to quirky restaurants, historical sites, arts and crafts, and natural beauties. The Nottingham Road Brewing Company is one of the attractions that should not be missed when spending time in this part of KwaZulu-Natal. This is the oldest brewery in the province and exudes a rustic charm that resonates with visitors, whether they are beer-lovers or not. Try the Wombling Wombat Summer Ale, Swinging Samango Mango Ale, Pye-Eyed Possum Pilsner, Tipsy Tiger India Pale Ale, and the Tiddly Toad Light Lager for something a little different. The brewery shop stocks awesome gifts, gimmicks and keepsakes too. Trout fishing is, by far, the most popular activity for visitors to Nottingham Road and there are a number of spots from which to choose. 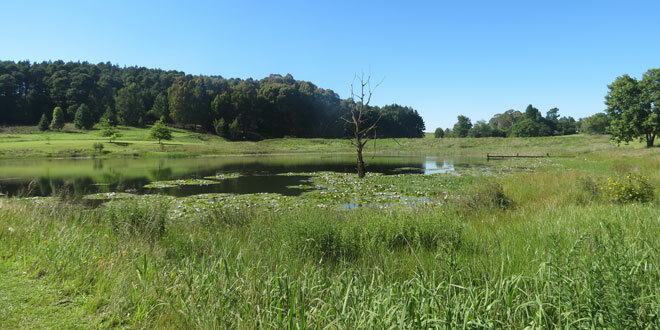 Kleinbosch Estate alone has seven dams that are well stocked with trout, as well as a shop with rods, reels and picnic baskets. Fordoun has two dams, which are used in local trout fishing competitions, thanks to the abundance of fish found in them. The Albert Falls Dam Nature Reserve offers some of the best bass fishing in the world and its dam is surrounded by stunning trails to walk and run. In addition to fly fishing, this reserve is great for game viewing and bird watching. The species within its borders include the red hartebeest, oribi, rhinoceros, giraffe, zebra, sooty flacon, black harrier, red-throated wryneck, black-winged lapwing, and the pennant-winged nightjar. Blueberry Hill, where a collection of artists and coffee connoisseurs provide the perfect place in which to relax and get your fill of creativity and inspiration. Gowrie Market – situated in the town itself, this market showcases the produce of the local farmers. Horse riding at Kleinbosch or Dargle is sure to be as fun as it is spectacular. Peruse the pickles and preserves, fresh vegetables, craft coffees, delicious biltong, homemade cheeses, and more at the Linga Lapa farm stall.